After leaving Tampa, we took the ubiquitous Interstate 10 straight through to Texas. I-10 is the major east-west highway through the southern U.S. so it’s the most convenient and direct route; however it does have some rough patches in Louisiana and we were sure we might lose some screws, or at least a side mirror during the trip. Luckily Rover is made of more sturdy stuff and we made it unscathed (this time). Stopping for gas at Buc-ee’s. Our first stop in Texas was a reunion of sorts. My friend Catherine moved to Katy, TX (a suburb of Houston) a few years ago so I wanted to visit and catch up. As life happens, friends move away and we see less of everyone. Since Mike and I were always on the move, we’ve been able to visit friends who relocated, but usually only one friend at a time. This time, we planned in advance and two other friends were able to fly to Katy and make it a small party for a few days! Unfortunately I had to be a bit of a party-pooper. Mike had caught some sort of sick (probably at the Tampa RV show) and had generously passed it onto me several days later. That meant the height of my sick happened just as we made it to Katy…boo! So I was able to hang out with everyone but our planned trip to the Johnson Space Center happened without us. Mike and I did vicariously live through our friends’ pictures though. It sounds like a fantastic place to visit and we’re both bummed we missed it but we know what we’re doing the next time we’re in Houston! Opie stretching his legs at the Katy TX dog park. We did enjoy ourselves even with the sick. We were able to take Opie and Catherine’s puppy, Riley, to the nearby Katy dog park. It was an impressive place with lots of trees, a fountain/pond, walking path, and lots of fenced-in space. Of course Opie took off for the water as soon as he saw it, and Riley had a blast running around chasing other dogs. Catherine also introduced us to Malaysian food in Houston Chinatown. We ended up there during Chinese New Year, so the area was packed! We were able to snag some ginormous macarons at the Chinese bakery! Again, everything is bigger in Texas. They were very good but definitely meant for sharing. This was such a wonderful reunion that we all decided that we need to make this a regular event in the future. Two weeks at the lovely McKinney Falls State Park in Austin. After our brief sojourn in Katy, it was time to take Austin by the horns. 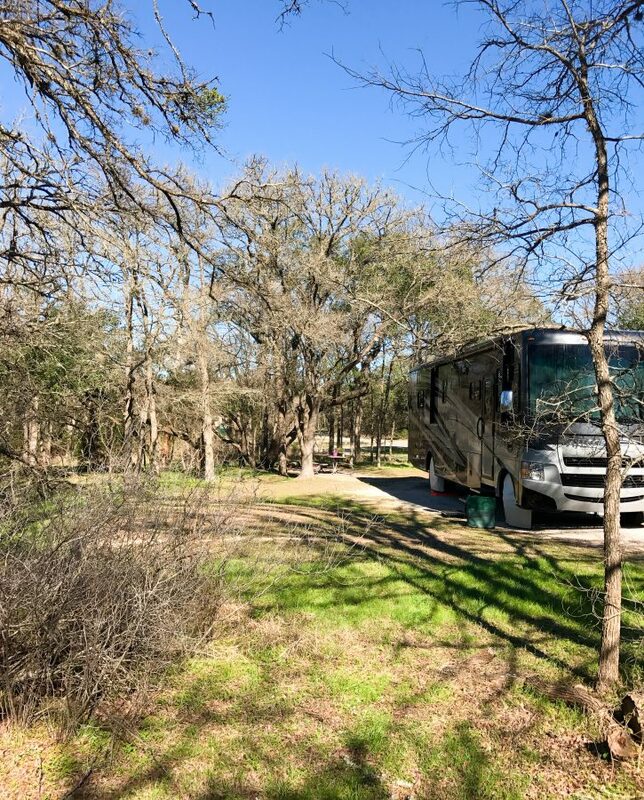 Two years ago we tried to visit Austin but we were RV noobs and didn’t realize that Thanksgiving weekend was a hotbed of camping activity so we failed to find any nearby RV accommodations at the time. This year Mike planned way in advance and we grabbed a nice spot at the highly recommended McKinney State Falls Park for two weeks. 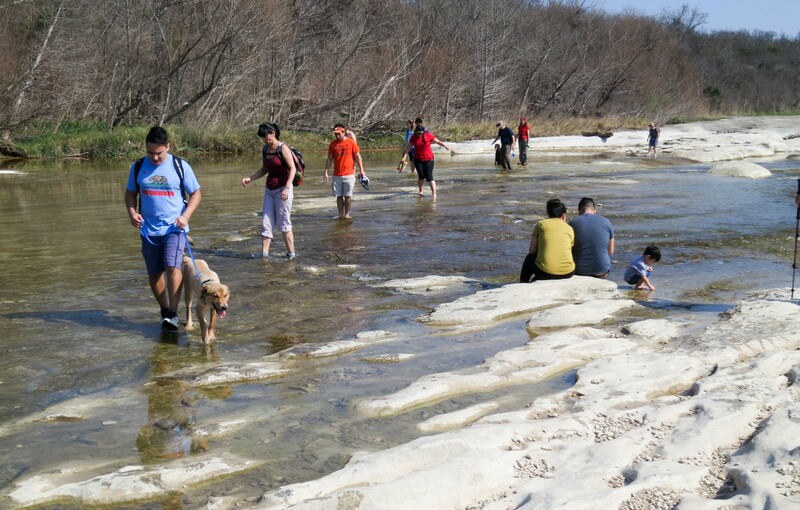 From the state park, it’s a short trip into Austin. From a distance, the HOPE Outdoor Gallery looks chaotic. We decided to play tourist while in Austin. Our first stop was to the Hope Outdoor Gallery (HOG). We visited during the middle of the week in the morning so we lucked out finding parking (FYI, there is very little parking by HOG, just some dead end street parking so finding a backup parking area is a must if you visit during the weekend). In 2010, HOPE (Helping Other People Everywhere) asked the owner whether they could paint positive messages on the side of an abandoned construction project. The owners agreed to allow HOPE artists to use the area for six months and the outdoor gallery took off from there. 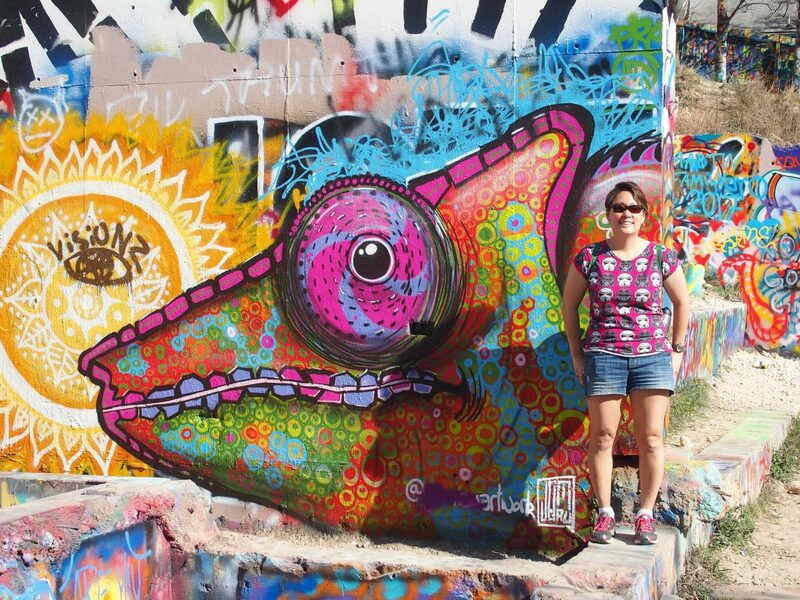 At present, the site is an open forum for graffiti artists, crafters, and visitors. Every inch (including exposed cables in the ground) have been painted and repainted. While there is some typical graffiti, there is some beautiful art here and it’s worth visiting. Get up close and you’ll find some beautiful art. 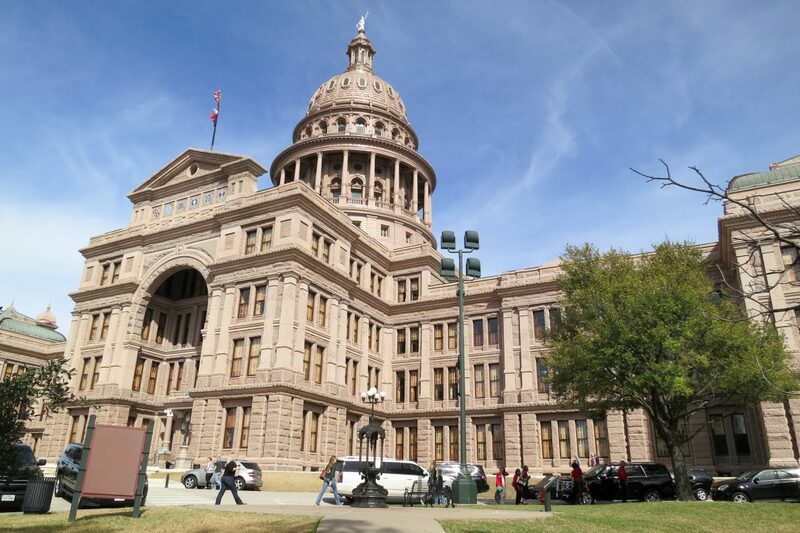 Since we were in Austin, we had to visit the Texas Capitol Building. They have free tours available every 20 minutes at the front entrance. It’s a pretty quick tour but has some good information. Did you know that construction of the capitol was funded through a barter transaction (actually the largest barter transaction recorded)? Texas paid Capitol Syndicate 3 million acres of land to construct the building and Granite Mountain donated all the red granite for the outside of the building. Approaching the Texas State Capitol building. Like all things in Texas, they built it big. It’s taller than the US Capitol by almost 15 feet, and has the largest floor space of any other state capitol building. 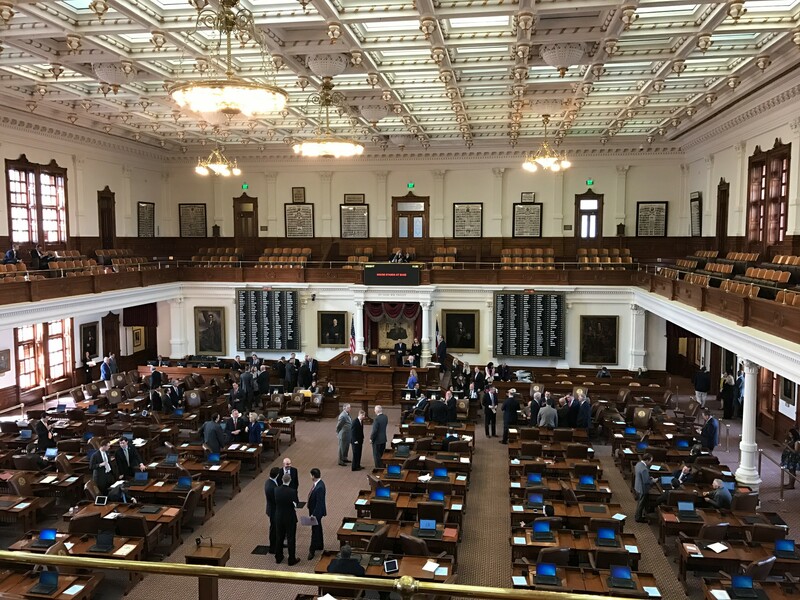 The Texas Congress was in session while we were there so we were able to sit in the gallery and observe. Unfortunately we got there during lunch hour so most of the representatives were out to lunch. Legislature is in session… but on lunch break. Darn! After touring the capitol building, we did a self-walking tour of historic Congress Street and saw the Governor’s Mansion, the old bakery, Capitol Building Ruins, the Paramount Theater, and various architectural designs. With all that, we were famished and hit Home Slice Pizza on S. Congress St. for lunch. Mike is from New York, which makes him a hardliner when it comes to pizza and bagels. He found the pizza to be, in fact, New York Style which made him a very happy eater. 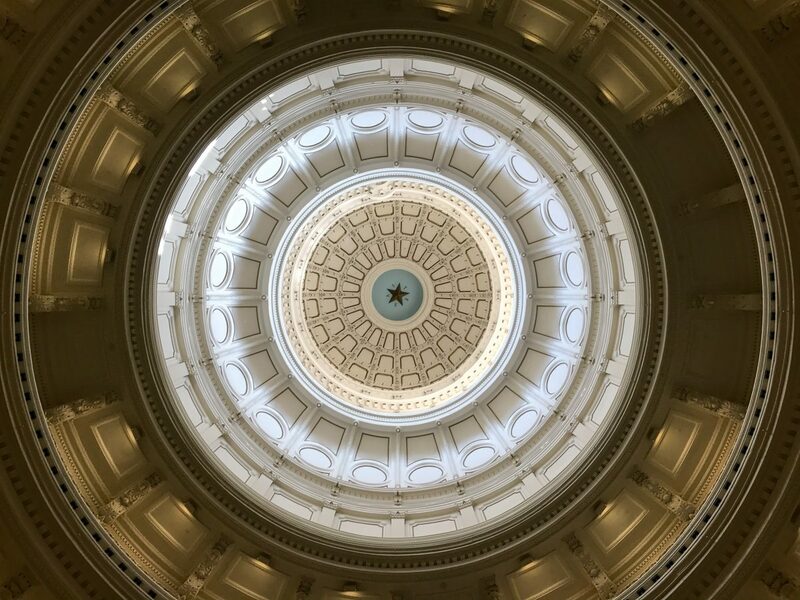 Looking straight up into the Texas Capitol’s dome from the ground floor. 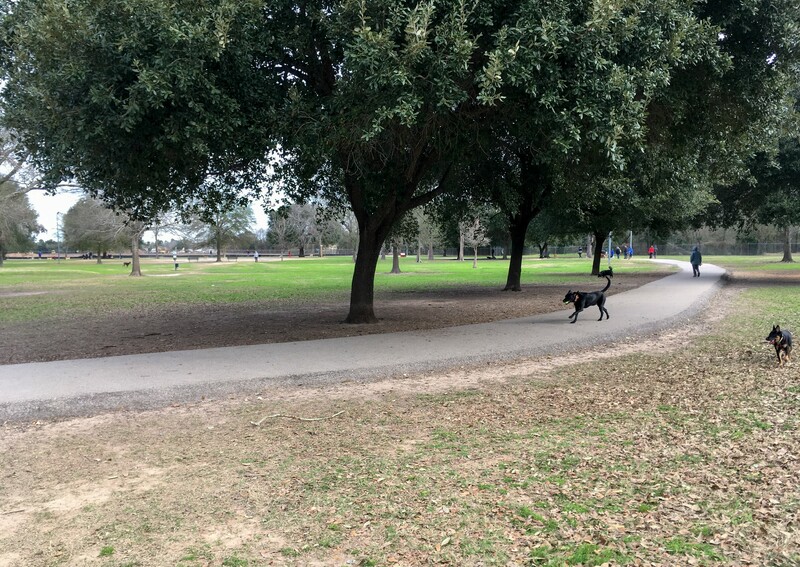 We took Opie to visit Zilker park, a huge recreational park inside Austin, filled with museums, gardens, a spring-fed pool, and an off-leash dog area. While the off-leash area is huge, it isn’t fenced in and it’s right next to a major four-lane road. We saw a young dog run across the busy road (twice) with our hearts in our mouth (we were too far away to do anything). After a lot of honking and stopped cars the dog made it across safely. We then followed the dog to try to find the owner who hadn’t realized what his dog had done and promised to watch him more carefully. 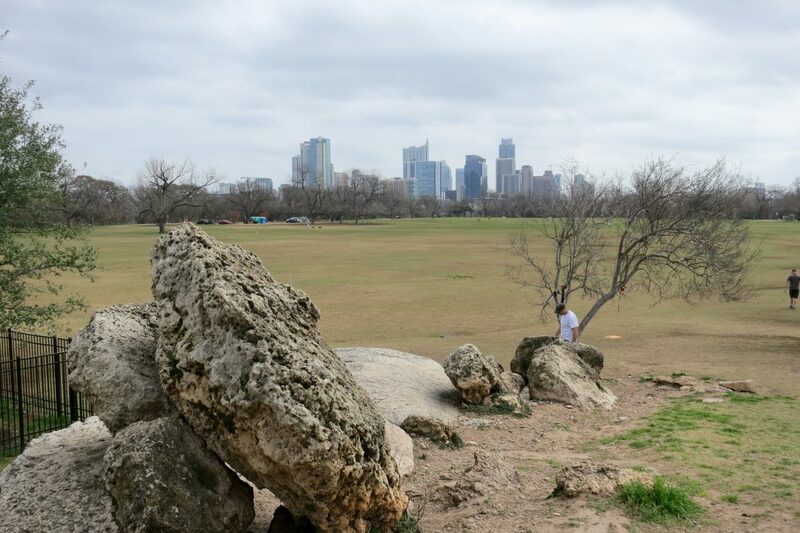 Zilker Park… not necessarily a good idea for dogs. The internet also recommended the view from Mt. Bonnell, one of the highest points in Austin. Who are we to turn down the internet, plus at only 780 ft above sea level, it should be an easy walk up. There is either a dirt path or stairs to get to the top (we opted for the stairs). From the top, you can see some great views overlooking the Colorado River. 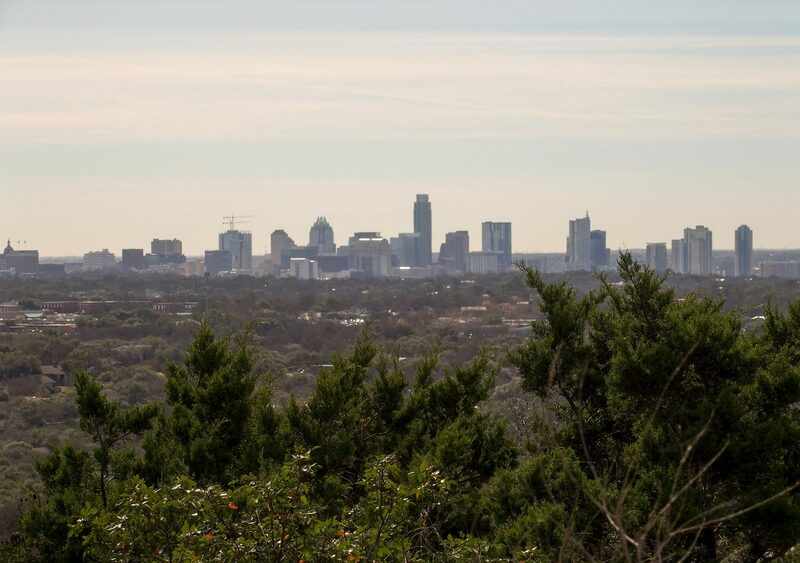 Unfortunately, a lot of tree overgrowth and a hazy sky made it difficult to see the Austin skyline (photo, top of page). Since most of our tourism involved excluding Opie, we had to do some hiking/strolling through McKinney Falls State Park where we were camped. Most of the time we stayed on the hiking trail near the campground, but we did take him for a nice long stroll on the northern trails one day, a combination of Homestead, Flint Rock, and Williamson Creek Overlook. Since we’re moving west and gearing up for more hiking, this is also a good way for us to get back into practice. Unfortunately to get to Homestead, we had to cross Onion Creek by rock hopping across slippery rocks. Opie had no problems (forget the rocks, just wade right into the water), but Mike’s socks got a bit of a dunking. It’s a nice easy walk though and we all enjoyed stretching our legs again. Crossing the creek without getting wet is a challenge. After our stay in Texas it was time to make the rest of our long journey to Arizona. Ok, can I just tell you? Since we’ve been in Texas, I have heard more about Buc-ee’s than any other person, place, or thing. It’s like a CULT around here! People LOVE that place! And yes, we are totally going to check it out, because it’s apparently THE place to go…. but I’m just saying: It’s a little weird. Also, that Louisiana stretch of I-10 was ABSURD. They need to invest in some new paving immediately! Thanks for some good Austin ideas. Safe travels west! No kidding. My friend in Texas says all her kids (school teacher) go regularly. 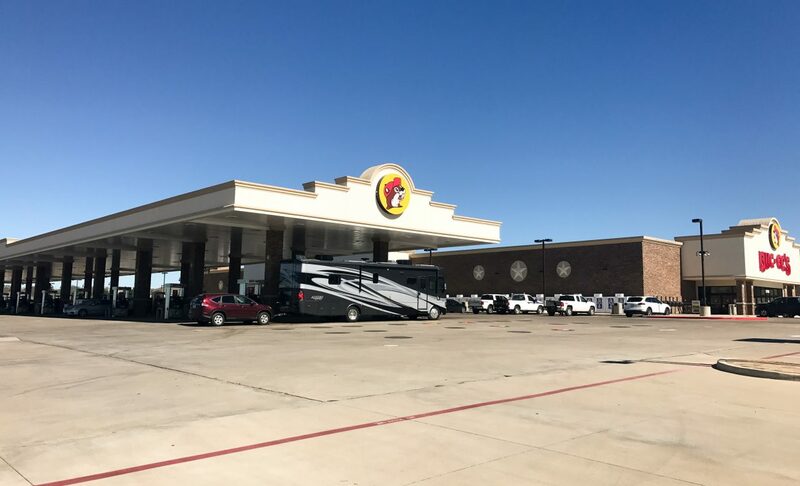 Just be careful, we did go to one Buc-ee’s that was not truck/rv friendly. This particular one did, so we figured we’d see what all the fuss was about….yeah, it’s just a big travel stop. It’s weird, I don’t get it. As bad as that stretch of I-10 was, we’ve hit worse in Montana. Our water pump stopped working and our backup camera wiring loosened during that drive. Is it a bad sign that we thought that stretch of I-10 wasn’t so bad compared to other roads after 3 years?? How far out west are you heading? Austin has some great breweries and food spots! Enjoy! So the farthest west we’re heading is San Antonio. Then we’ll head north to Austin and then to Dallas. We gotta be back in NOVA by mid-May for a wedding, which is a total bummer. We’d love to keep heading west. But, such is life….We’ll get there eventually. If you have other specific recommendation for Austin, let us know. Just ran across your blog and was doing a little reading and catching up. I bet the capital was a neat visit and a bummer that most were out for lunch during the session you were there. Loks like quite a hike up My. Bonnell but being lined with trees made it a pleasant and relaxing jaunt. Hi, Austin is a good place to visit and we did enjoy seeing the various sites. It is too bad they were out for lunch, I think it would have been fun to watch congress in session for a little bit. Mt. Bonnell stairs aren’t actually as imposing as the picture looks. It’s only about 100 steps so you’re at the top before you know it and the view is worth the climb. 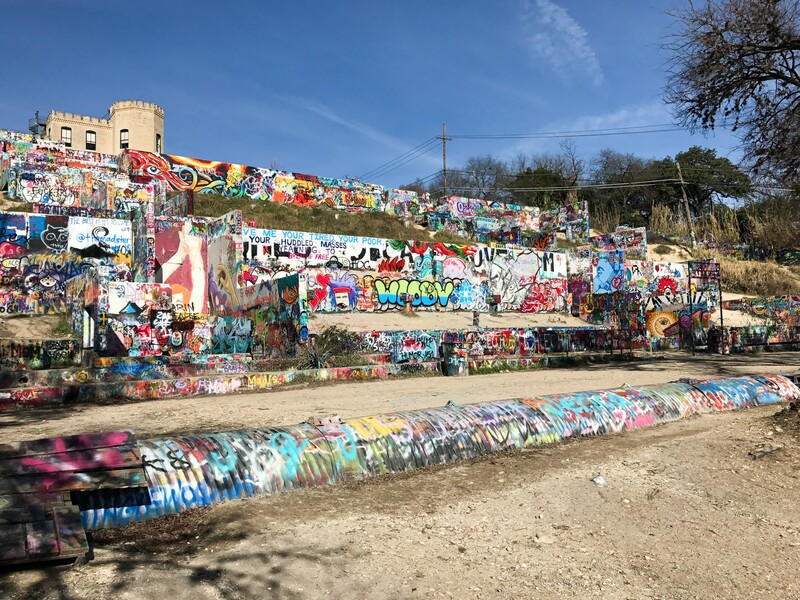 If you’re in the area, Austin is a good spot to take a quick visit! 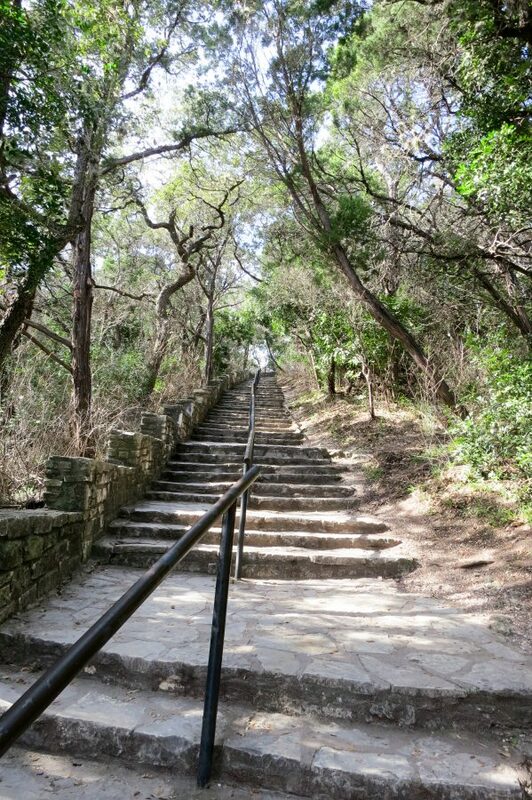 Thanks for clearing up those steps and you thoughts of Austin. I was born and raised in NYC. Since leaving for college in Arizona, I have lived in PA, DEL, MD, FLA, NJ, AL, KY, OK and now in IA. With the exception of northern NJ, I have yet to find pizza or bagels anywhere near comparable, let alone as good, as found in NYC. When we hit the road fulltime in 2 years, I will have to sample the goods in Austin, but I must say I am a bit skeptical. What part of NY is Mike from? ‘dem is fighting words! :) Mike is from Long Island. We have found good NY style pizza in a few places we’ve been but it’s usually easier to find good bagel joints. I have to agree with you though, NY and NJ has some darn good pizza! When we end up in a new town, Mike gets online and looks for bagel places that boil then bake. We’ve found an excellent bagel place in MD, and a good one in Tucson. Austin had a pretty good bagel place too. Pizza is much more subjective so finding a “good” pizza place doesn’t usually mean the same to everyone, so I understand your skepticism. Yeah. The boil and bake…. the ONLY way to make a good bagel. If only more of these “bagel” shops around the country would only figure that out! !